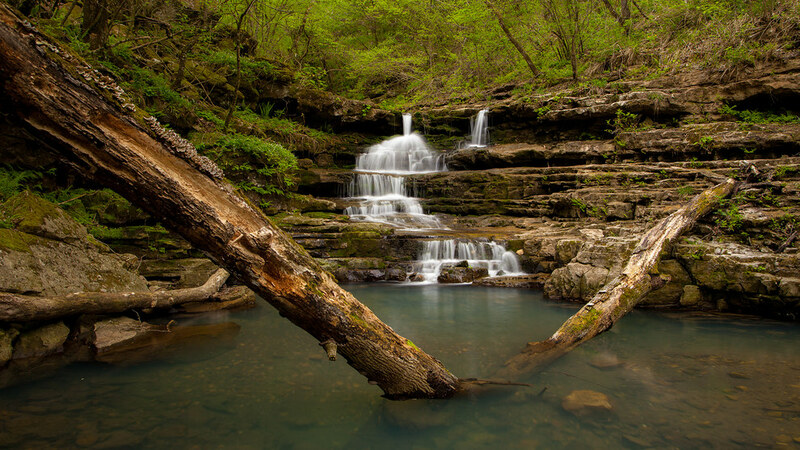 Matthew Kennedy, Brian Cormack, and I had planned to take a weekend this spring and get out and photograph some of the beautiful waterfalls that the Natural State holds. Indian Creek is high up on my list of the most beautiful places in Arkansas. It’s also high up on the National Forest Service’s list of dangerous locations, because of the amount of accidents that occur here. It’s incredibly steep and treacherous, but with that diverse landscape comes an incredible sense of alluring beauty. Unfortunately, Matt wasn’t able to make it on the trip, but Brian and I were. We left Little Rock around 4 that Friday and made our way towards Kyle’s Landing on the Buffalo National River. Upon arrival at the campground, we were greeted by at least one hundred other vehicles packed with people who had the same idea as us: to enjoy the great Arkansas outdoors on this wonderful weekend. Luckily for us, most of them were more interested in floating the Buffalo River instead of hiking into Indian Creek. Since we arrived so late into the evening, we were not able to get a great campsite, so we setup in the primitive camping area. After a couple of beers and a good conversation, we passed out in our respective tents. With that many people in the campground, it wasn’t easy to sleep. Cars were driving in and out all night and people were being loud and enjoying each other’s company. That was unfortunate, because mine and Brian’s plans involved us waking up at the first light of dawn. We started our hike into Indian Creek around 5:45, right as the early morning light was beginning to lighten up the campground; the other campers were still fast asleep. The hike into Indian Creek that morning was beautiful and the early morning light was just perfect for capturing a few photographs. So, that’s exactly what we did. We took our time exploring every little bit of the creek and made our way slowly up the canyon. Towards the top of the hollow is where things become very interesting. Copperhead Falls, the waterfall in the wallpaper this week, is the first of three beautiful larger waterfalls that you see in Indian Creek. It is also the gateholder to the end of the “easier” hike into Indian Creek and where most individuals would be smart to turn around. However, Brian and I are either very courageous or very dumb, because we were determined to make it to the “Eye of the Needle” this day. Where Tunnel Cave Falls spills out of a cavern in the canyon wall, opposite lies a tree up on a cliff with a rope attached. That’s all the hint you get at the trail to the eye of the needle. Climbing the rope and thereafter the hill is insane, but totally worth it to those crazy enough to do so. After climbing the rope and the hill ahead, you are greeted with a hole just big enough to climb through. After crawling through this hole you’re no longer in Arkansas. You are in a boulder garden of immense proportions. Rock hopping through the garden is both fun and treacherous, but the prize at the end is incredible. The Eye of the Needle is exactly that, a huge rock formation which appears to be a needle’s eye. After heavy rain water pours out of the eye and forms a beautiful waterfall. The scale of the place is unimaginable and truly breath-taking. Regardless, I absolutely do not condone nor recommend anyone reading this attempt to climb to the eye of the needle. If you decide to anyways you waive, entirely, my liability of you doing so! Even after all the beauty that we saw that day of Indian Creek, I still feel like this image is my absolute favorite from the hike. I hope you enjoy it just as much as I do! If you’d like to see some photos of the Eye of the Needle, check out Brian’s post on his website about this trip. He’s got a great series of photographs from the trip.